This nearly global mosaic of observations made by the Mars Color Imager on NASA's Mars Reconnaissance Orbiter on Nov. 18, 2012, shows a dust storm in Mars' southern hemisphere. Small white arrows outline the area where dust from the storm is apparent in the atmosphere. A NASA spacecraft is keeping tabs on a vast dust storm on Mars that has spawned changes in the Martian atmosphere felt by two rovers on the planet's surface. The Martian dust storm was first spotted by NASA's Mars Reconnaissance Orbiter (MRO) on Nov. 10 and has been tracked ever since. The agency's Mars rover Opportunity has seen a slight drop in atmospheric clarity due to the storm. Meanwhile the newer Curiosity rover — which has a built-in weather station — has seen a drop in air pressure and slightly increased nighttime temperatures halfway around the planet from Opportunity, NASA officials said. "This is now a regional dust storm," Rich Zurek, NASA's chief Mars scientist at the Jet Propulsion Laboratory in Pasadena, Calif., said in a statement Wednesday (Nov. 21). "It has covered a fairly extensive region with its dust haze and it is in a part of the planet were some regional storms have grown into global dust hazes." NASA is combining observations by the Curiosity rover and MRO to create a complete picture of the Martian dust storm. 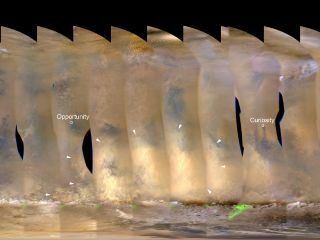 The Spain-built Rover Environmental Monitoring Station on Curiosity gives scientists a real-time look at conditions over the rover's position inside Gale Crater. "For the first time since the Viking missions of the 1970s, we are studying a regional dust storm both from orbit and with a weather station on the surface," Zurek said. Because the dust from the current storm is absorbing sunlight instead of reflecting it, a warming effect 16 miles (25 kilometers) above the Martian tempest has been seen by MRO. The effect, first recorded by MRO's Mars Climate Sounder on Nov. 16, has led to a temperature increase of 45 degrees Fahrenheit (25 degrees Celsius) so far. Warmer temperatures are not confined to the Martian south. The circulation of the Martian atmosphere has also led to a hot spot in the planet's northern polar regions. The temperature on Mars is typically about minus 80 degrees F (minus 60 degrees C), but can vary depending on location and the Martian season. "One thing we want to learn is why do some Martian dust storm get to this size and stop growing, while others this size keep growing and go global," Zurek said. A global dust storm on Mars could have implications for the Opportunity and Curiosity rovers. If the current dust storm were to expand to cover the Red Planet, the dust settling on Opportunity's solar panels could reduce the rover's power supply. Opportunity has been exploring the plains of Meridiani Planum since its 2004 landing on Mars. NASA's newer Mars rover Curiosity, meanwhile, would likely see increased haze in its photos of nearby terrain, as well as an above normal air temperature. The 1-ton Curiosity rover landed on Mars on Aug. 5 and is powered by a radioisotope thermoelectric generator that is unaffected by dust storms.